Scale model of pressure chamber. This is about making a filament wound 3/8 scale model of a 2 ATA pressure chamber I'm planing to build. See how the pattern was made here. Making this model did not go smoothly. The process did answer all the questions I had so that I'm confident I can build the full sized one. This is the thin fibreglass mandrel which will be used to wind epoxy glass around. This is just a shell made of chopped strand matt and expoxy. It is about 1mm thick and should be firm enough the support the glass which will be wrapped around it. The mouth of the chamber was molded around a food storage container. The same SAM7 based MT-256 micro-controller module as used previously was used to control the stepper motor. Commands were once again sent using hyperterminal runnning on a dell notebook. The firmware in the SAM7 was slightly improved to allow the winder to be stopped and restarted again - very usefull. I could also fine tune the motor position and change the turnaround delay at the big end of the chamber - these features weren't very usefull. I make no apologies for how it looks. 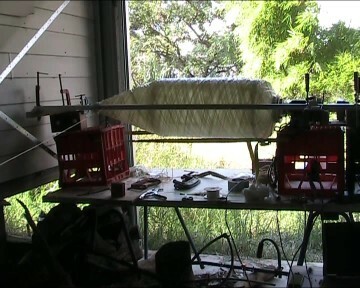 This machine is a scale prototype which is planned to be use only once with a total working life of two to four hours. There are lots of zip-ties, tie down straps, tech screws, g-clamps and milk crates used. Duct tape was on standby but not needed. Some of the parts are recycled from the smaller winder. A tent pole runs from the mouth to the tip and the spike on the end of the pole passes through the tip and into a brass plumbing fitting. This is my tip bearing. I bought a cheap bench grinder and used it for the spindle bearings. The grinding wheels were replaced by pieces of wood. The piece on the left was screwed to the spool from the boat winch. The one on the right was shaped to fit the mouth. Tests using string and later resin (without harder) soaked glass showed I had serious problems. The stepper motor struggled and missed steps. I didn't have time to install a more powerful stepper or reduced the pully size so I disabled the fibre tensioner. This was better but I also had to increase the hole size in the resin wiper (syringe) before the stepper would step accuratly. Therefore I was winding loose and wet. The body of the chamber wound nicely but the cone started off quite messy. The fibre would slip, go slack and often bunch up. Fortunately as the winding progress this improved and the fibre would lay down in a more uniform manner when laid over other wet fibre. At the dome end things were sadder. The irregularity in the dome ie the hex shape caused the fibre to catch leaving patches which never were covered by the winding. When the job was about %70 complete the resin consuption became extreme and I stopped the winder and replace the wiper. I mixed 240 grams of resin in each batch and that may have lasted 10 minutes. In other words about 1.5 litres per hour (at a rough guess). One person can quite comfortably keep up with this but when things go wrong it is too much work. I did run out of resin on a few occasions but the dry fibre was soon soaked by the excess resin on the surface on the chamber. After the wiper was replace I had problems again with the stepper loosing steps and I manually pulled the head back into place as needed. It seemed like there may have been a resonance problem and lightly touching the head while in motion seemed to improve it. The winding took about 3.5 hours. This winding sequence has 351 head passes in each direction. In other words if you cut the chamber through the middle ( across not length ways) would would cut 702 fibres roving. If each roving had a breaking stain of 30Kg that would be a combined strain of 21 tons. The fibres are a long way off axis but if only 10 percent of that strength was used to keep the end from blowing off that is a couple of tones - which is about right for two bar relative. The dry breaking strain I guess to be 30K but this isn't a very useful value a cured epoxy glass roving will be much higher. I will measure it one day. Three tech screws on the wooden drive lets me wind on the dry fibre at the start of the winding session. The glass comes in 17Kg spools and is usually used for chopper guns. The continuous fibres in this form are often referred to as "rovings". The glass is quite cheap at around $2.20 a kilo. The epoxy resin on the other hand is quite expensive at around $380 for 25 kilos (20 kg resin 5 kg hardener - say $15/kg. This is one reason a good fibre/resin ratio is important - too much resin means an expensive composite which is weaker than it should be. The FGI E180 system I use has a choice of three different hardeners for different curring speeds - I used the slowest one. The model uses maybe $130-$150 in materials but I'd rather spend that than have the big one fail. Polyester or vinyl ester resins are much cheaper and are probably strong enough. The problem with them is they stink and give me bad sinus problems. They are also oxygen inhibited and require wax additives to harden properly on the surface - this could be a problem if the winding is done in stages. Maybe 20% into the wind and the tip is finished. There is still a lot of winding to do before the body is covered. Barry visited and took a photo of me just before I called it a day and cut the fibre. It looks like a large maggot here. I prefer to think of it as a silk cocoon. The chamber came off the winder quite easily. I would not have been surprised if resin had worked its was into the tip-spike or the lid area but it hadn't. This thing feels very solid, I think you could sit a truck on it without crushing it. The competed vessel after a day of curing. Mostly good despite the problems I had. It is a 13 Kg. The big end did not wind well with the glass catching on the "corners" of the hexagonal approximation of a dome. I think it will still hold pressure despite the defects. Looking inside you mainly see the wrinkles in the inflated mould and the seam in the mould. The internal lid is being held in place by air pressure. The magnets are an improvised handle. So far I've tested the model to 30 PSI - twice the intended working pressure. The chamber wall is not to scale and should be able to take twice the pressure of the full size chamber. I was really testing the defects in the winding and the strength of the lid. All seems good so far. I don't have a good seal though and there is work to be done in this area. Using simple measurements will a metal ruler and string I was unable to detect any change in size when pressurized. Glass can stretch around %5 to failure and the resin should be similar. I was getting far less that %1. The whole point of making a model is to sort out any issue on a more manageable scale. There were a number of specific sub-systems I wanted to test and there were questions I wanted answered. Mostly the results were positive but a few weren't. Q-Is the stepper strong enough. I didn't expect it to be strong enough for the full scale job but I did expect it to do the 3/8 scale. A-It was either too small or had a resonance at 100 step/sec. Solution - bigger motor and/or use a smaller pulley or gear it down. The existing motor is fast enough that it could be geared about 5:1 for the scale model and 2:1 for the full sized one. Slowly the winding down would allow even higher gearing. Q-Will the resin bath work at the higher speed (than when I did the 1/10 winding). A-It seems to work fine at around 250mm/sec and will probably be fine at 600mm/sec. This is however untested in cold weather when the resin may be thicker. Again we can slow the winding down if we have to - it will just be more boring. Q-Can I have a long winding session without the resin setting inside parts on the bath/wiper. A-Seems fine. This was a hot day and it ran for two or three hours before being stopped to replace the wiper. The resin bath didn't seem to have any hard resin in it after 3.5 hours. The new resin seems to flush out the older stuff. I'm expecting it to take about 4 hours to wind on one 17Kg spool of glass fibre. This is expected to happen in autumn or winter when the cool weather will extend the resin pot life. Even if I had to stop every few hours for a cleanup it wouldn't be a big problem. Q-Is my approximation of a dome good enough. A-It doesn't look that way. It is possible more filament tension would improve things but I doubt it. I will look at either doing a proper spherical end or a shallow cone. Start of the winding session. Created by eddie. Last Modification: Saturday 24 of May, 2014 18:33:04 AEST by eddie.